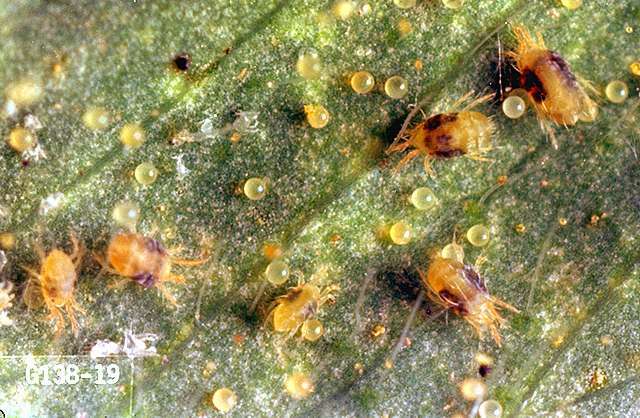 plant-derived essential oils (such as clove and garlic) have some efficacy against spider mites. Some formulations are OMRI-listed for organic use. abamectin (Agri-Mek, Epi-Mek) at 0.009 to 0.019 lb ai/a. PHI 7 days. REI 12 hr. Retreatment interval 7 days. Do not exceed 0.056 lb ai/a per season. acequinocyl (Kanemite 15SC) at 0.3 lb ai/a. PHI 1 day. REI 12 hr. Retreatment interval 21 days. Do not exceed 0.6 lb ai/a per season. bifenazate (Acramite 50W) at 0.0375 to 0.5 lb ai/a. PHI 3 days. REI 12 hr. bifenthrin (Brigade WSB) at 0.08 lb ai/a. PHI 7 days. REI 12 hr. Do not exceed 0.2 lb ai/a per year. Do not apply less than 7 days apart. bifenthrin/avermectin (Athena) at 0.09 to 0.12 lb ai/a. PHI 7 days. REI 12 hr. Retreatment interval 10 days. Do not exceed 0.056 lb ai/a avermectin or 0.4 lb ai/a bifenthrin per season. borate complex (Prev-Am Ultra) applied as a 0.4% solution. Apply to complete coverage. PHI 12 hr. Retreatment interval 4 days. OMRI-listed for organic use. etoxazole (Zeal) at 0.09 to 0.135 lb ai/a. PHI 7 days. REI 12 day. Do not exceed 0.135 lb ai/a per season. Limit 1 treatment. fenbutatin-oxide (Vendex 50WP) at 1 to 1.5 lb ai/a. PHI 3 days. REI 48 hr. Do not exceed three applications or 4.5 lb ai/a per year. Limit 3 treatments per season. fenpropathrin (Danitol 2.4EC) at 0.2 lb ai/a. PHI 3 days. REI 24 hr. Do not exceed 0.8 lb ai/a per season. Retreatment interval 7 days. fenpyroximate (Miteus) at 0.1 lb ai/a. PHI 1 day. REI 12 hr. Retreatment interval 14 days. Limit 2 treatments. Do not exceed 0.21 lb ai/a per season. gamma-cyhalothrin (Declare) at 0.01 to 0.015 lb ai/a. PHI 5 days. REI 24 hr. Do not exceed 0.18 lb ai/a per season. Retreatment interval 5 days. hexythiazox (Onager) at 0.94 to 1.88 lb ai/a. PHI 1 day. REI 12 hr. Limit one treatment. Do not exceed 0.188 lb ai/a per season. insecticidal soap (M-Pede) at 1 to 2% solution. Potassium salts of fatty acids. See label for gal/a. PHI 0 days. REI 12 hr. Some formulations are OMRI-listed for organic use. naled (Dibrom 8E) at 0.94 to 1.88 lb ai/a. PHI 1 day. REI 48 hr. Retreatment interval 7 days. Limit 5 treatment per season. Do not exceed 5.64 lb ai/a per year. oxamyl (Vydate) at 0.5 to 1 lb ai/a. PHI 1 day. REI 48 hr. Do not exceed 6 lb ai/a per year. propyleneglycol monolaurate (Acaritouch) at 12 to 25 oz/100 gal of formulated product. PHI 1 day. REI 4 hr. spiromesifen (Oberon 2SC) at 0.11 to 0.13 lb ai/a. PHI 7 days. Limit 3 treatments per year. REI 12 hr. Do not exceed 0.4 lb ai/a per season. Retreatment interval 7 days.